Need some tips on how to Stock Your Home Bar for your next party? 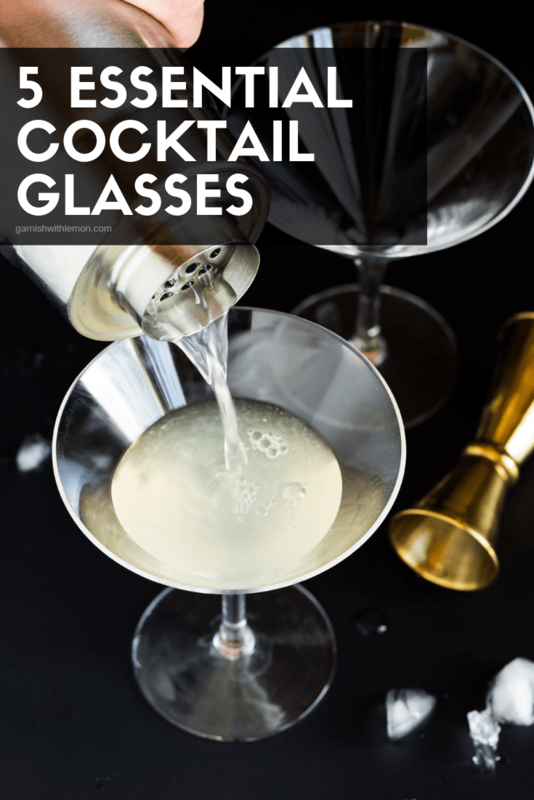 Don’t miss our list of 5 Essential Cocktail Glasses! Welcome to a new series on Garnish with Lemon! We get a lot of questions from our readers about how to prepare for their upcoming parties, especially when it comes to adult beverages. 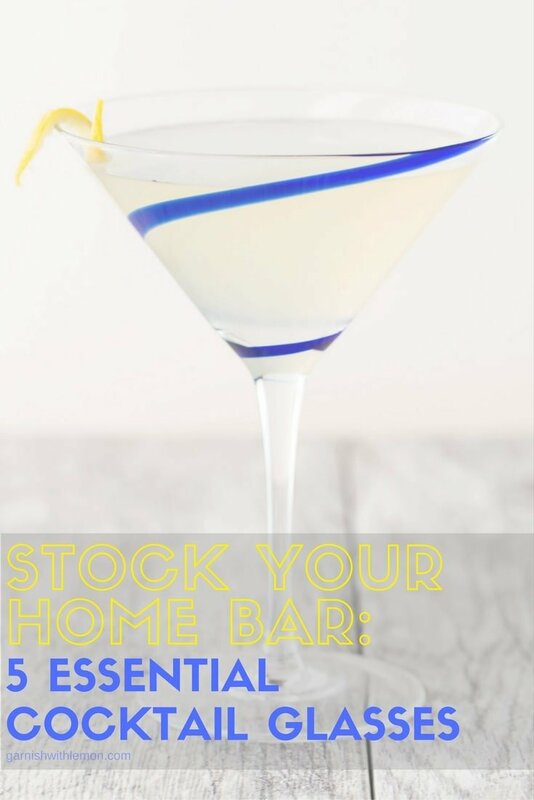 Our new series, Stock Your Home Bar, was born to give you guys the must-have items you need for a party-ready home bar. Over the next few months, we’ll feature a variety of topics including cocktail garnishes, types of liquor to have on hand, and of course, lots of delicious cocktail recipes. But today we’re starting with the basics: 5 Essential Cocktail Glasses. Check the list below to see if you’re stocked for your next party. This tall and slender glass is extremely versatile. Ranging anywhere from 8-12 ounces, the Highball is perfect for liquor and your favorite mixer. Think anything with sticks and straws. Also makes a great glass for non-alcoholic beverages. Short and squat with a thick, heavy base, the Old Fashioned glass holds about 6-10 ounces of liquor and is perfect for stronger drinks you enjoy “on the rocks” with ice or neat. We’ve always called these Martini glasses, but they are officially known as “cocktail” glasses in the bartending world. Designed to hold chilled drinks without ice, they range in size from 4 -10 ounces. Go smaller on this one; the larger glasses are too hard to carry around without spilling. Often called a champagne glass, the unique shape of the Flute was designed to prolong the bubble in your sparkling drinks and on average holds about 6 ounces of liquor. Stemless Wine Glasses make a great alternative to Old Fashioned glasses, especially when serving batch cocktails. Available in a variety of sizes as well as acrylic versions, which are perfect for outdoor parties.